This color is referred to as "Yellow" in Shelby records. No one can argue the color WT 6066 is a special paint color. But, it is certainly different from the other five special colors. 144 of the 159 special paint cars were yellow. 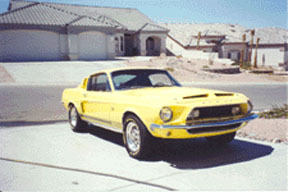 Yellow Shelbys were the only cars that used black rocker panel stripes. WT 6066 actually replaced the color Sunlit Gold (Ford code "Y"). "Why ?" Well, there were not too many fans of gold painted Shelbys at AO Smith. During the spring of 1968 someone noticed the AO Smith gold paint did not match Meutchen Ford assembly gold paint. Not really a problem, unless you have already assembled a batch of brand new gold Shelbys. Fiberglass front ends and decklids were pre-painted. AO Smith was forced to remove the fiberglass from 38 cars and repaint them to match the body shells. It was an expensive undertaking and no doubt, caused some hard feelings. So you won't see any gold GT500KRs, because Sunlit Gold was history by the time the Cobra Jet cars arrived. This beautiful yellow fastback belongs to Lisa Mucelli. Thanks for the picture Lisa ! It is # 4100. The table below summarizes the Yellow cars produced for Shelby. Notes: Seven GT350 convertibles were scheduled to be yellow, but only six were produced. One of these cars was painted white by mistake. The exact number of yellow GT350 fastbacks can not be positvely identified, but it is believed to be eight. By looking at the chart above, you can see that the total number of yellow 1968 Shelbys produced is 144. By taking the total number of special paint cars (159) and subtracting the colors other than yellow (15), the total of yellow cars is placed at 144. To date, 14 of the non-yellow cars have been located. Let's take a look at the yellow convertibles! There were 49 yellow Shelby convertibles. 42 yellow cars were GT500KRs and 7 cars were GT350s. Maybe you know where a missing special paint car is? If you do, drop me an email...and remember, there were no GT500 special paint cars.